And here we are with my third misguided papercraft bingo. I'm not sure yet if I will go back and try to create with the CURRENT bingo challenge, or not. 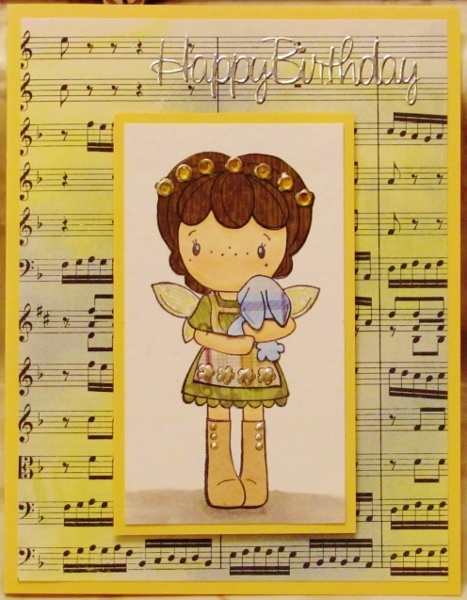 For this card I used "Paper Piecing", "Patterned Paper" and "Ribbon". For this one I chose a couple of background papers I had created a while back and combined them. The back layer, bordered by a white shimmer cardstock over a magenta base card, is an alcohol ink/metallic marble on glossy cardstock. Over this I used a diecut shape cut from a wrinkle-free Distress panel. 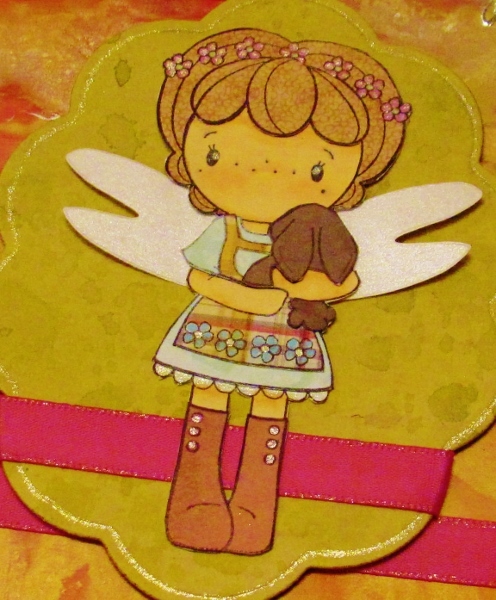 For the stamped image, I colored all the skin with alcohol markers and paper pieced the hair, clothing and bunny. I used a craft knife to trim close around the image, separating it from its white background. I used a die to cut two skinny hearts from shimmer paper and used them behind the image as wings. I used glimmer gel pen on the flowers in her hair, her eyes, the lace hem and the buttons on her boots. I was liking this glimmer so I added it to the rim of the diecut background and on both edges of the ribbons. I used a large silver peel-off greeting at the top of the card. With still the wrong bingo challenge in hand I used the paper piecing parts I had set aside to make another card. This time I used, from the bingo grid, "Paper Piecing", "Candy Dots" and "Blue". I chose a white cardstock with embossing on it and sponged on blue Distress Ink to show off the texture, rounded the corners and mounted it on a blue card base - also with rounded corners. 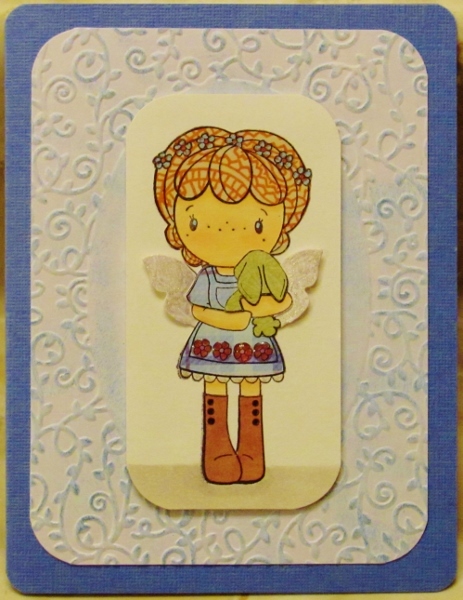 On the stamped image, I used alcohol markers to color all the skin areas and the ground and then paper pieced the hair, clothing and bunny with scrapbook papers. I used gel pens to color in the flowers in her hair and on her apron, her eyes and the buttons on her boots. I only had clear candy dots so used them over the flowers on the apron. I used a craft knife to cut along the edges of the image and slid the halves of a die cut butterfly in to replace the stamped wings. These were popped up on foam tape. I rounded the corners on the image panel and popped it up on foam tape over the background. Then I used glitter dust gel pen over the wings and the lace on her hemline. I am SO-O-O-O-O lost! I set aside a papercrafting challenge to work on later and then, when I pulled it out, I pulled out an OLD one that looked similar to it instead. So I made three cards for the challenge and then can't use them for that after all! The challenges were both papercrafting bingo where a 3 x 3 grid is filled with techniques, colors, etc and you make a card that uses three of them that appear in a line in any direction - 8 combinations are possible. 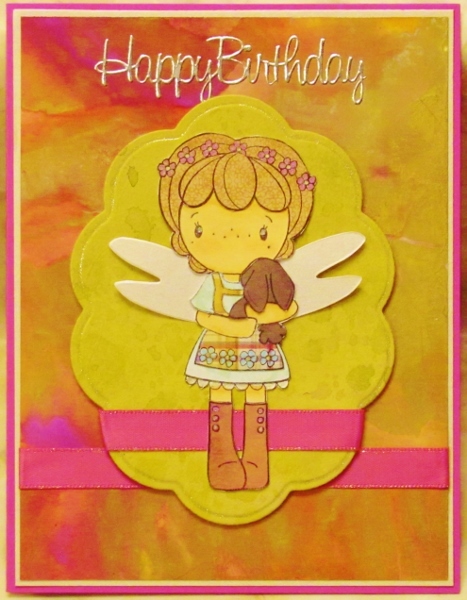 So, for the first card I chose to use "Birthday", "Yellow", and "Paper Piecing". Quite a while back I had stamped an image on various scrapbook papers as well as on a white background. Then I put them all in an envelope to use later... hey, it's later! On the white layer I used alcohol markers to color all the areas of skin. Then I cut all the papers and layered them onto the hair, clothing and bunny. I used alcohol markers to color a ground for her and colored her wings with very pale yellow. I bordered the trimmed image with bright yellow and popped it up on foam tape over sheet music I had sponged yellow and grey Distress Inks onto. For embellishments I added rhinestones over the flowers in her hair, Liquid Pearls to the buttons on her boots and the flowers on her dress and glitter dust gel pen to her wings. I used a large silver Dazzle sentiment at the top.